For over 60 years, Brazil has been tormented by the memory of El Fantasma (The Ghost). 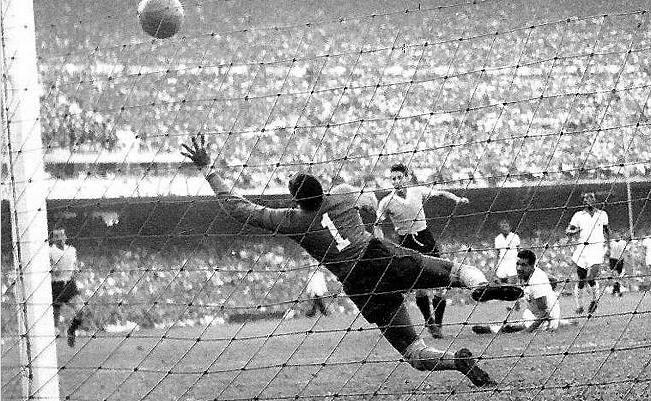 It was at the Maracana in the 1950 World Cup Final when Alcides Ghiggia, Uruguay’s winger, became the Selecao’s chief antagonist as he instigated Los Charrúas’ shock 2-1 win over the hosts. The fall-out from that tournament was huge. There were deaths and the stain on Brazilian football resulted in the South Americans pressing the reset button. Their national strip changed from white to gold with green and blue. The past was firmly behind them and the colours of the Bandeira do Brasil heralded a dominant era as the Selecao won three of four World Cups between 1958 to 1970. The Brazilian team was revered the world over, yet for all their plaudits, the Maracanazo (disaster of the Maracana) has always remained a vivid living nightmare—until yesterday. After waiting 64 years to put right what once went wrong, Luiz Felipe Scolari’s players managed to perpetrate a far worse nightmare upon their nation. Brazil utterly capulated—losing 7-1 to Germany. When Thomas Mueller was given the freedom of Rio de Janeiro to pick his spot for the opener, precedence had been set for the remainder of the match. The Germans, with ruthless efficiency, exposed their opponents’ weaknesses at will with an abundance of power, pace and accuracy in their penetrative play. In 179 bewildering first-half seconds the scoreboard changed from 1-0 to 4-0. Miroslav Klose etched his name into World Cup folklore with his 16th goal to move one clear of Ronaldo. Toni Kroos’ impressive tournament continued with the fastest brace in World Cup history—69 seconds between his two strikes. Superlatives were insufficient. Sami Khedira added another shortly before the half-hour mark. The half-time whistle sounded at 5-0. Brazil’s back four and goalkeeper, previously all Champions League winners, had been thoroughly schooled. Thiago Silva’s absence, ahead of Neymar, was always going to be more influential for Scolari. He gave the captaincy to David Luiz who failed to justify that decision with a performance that no child should ever seek to learn from—how Jose Mourinho must have chuckled to himself after Paris Saint-Germain secured the defender’s services for approximately £40m only weeks before. Brazil attempted to salvage some pride early in the second half, but Manuel Neuer ensured he earned just as much praise as his outfield players by thwarting Paulinho with a superb double save. Andre Schurrle then got in on the action from the bench to score his own brace. 7-0. The Germans’ professionalism was evident when Oscar scored a late consolation as Neuer screamed at his defence for the momentary lapse in concentration. Final score: 7-1 to Germany. Having conceded seven goals at home, Brazil’s hurt will be immeasurable. The players and management fragile states will open up the debate as to whether their over reliance on a sports psychologist greatly backfired. All too frequently the outpouring of emotion during the anthems heralded cries of unrivalled passion from so-called experts but the grim reality may be that the pressure just got too much for an ordinary team devoid of stereotypical Brazilian flair. After Tim Krul grabbed the headlines against Costa Rica, the Dutch failed to produce back-to-back penalty shoot-out victories as Argentina’s Sergio Romero halted the Netherlands quest to make a second successive World Cup final. There would be no repeat of Krul’s heroics as Louis Van Gaal had used all three of his available substitutes before the end of extra-time. In a largely drab affair the South Americans progressed to keep Lionel Messi’s dream of lifting the World Cup alive and, in turn, cement his place along the plethora of footballing greats. Messi was shackled by the Dutch who ensured he had Oranje company every time he had possession. In the end, there was nothing to pick between the two sides with Argentina prevailing. Based on this showing, Germany will be crowned World Champions for a fourth time on Sunday. – Group E: Wasteful France still secure top spot and Shaqiri’s hat-trick results in Swiss progression.